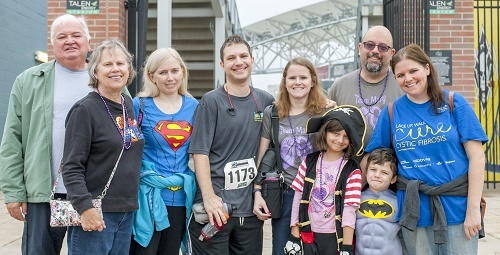 The CF Climb Spotlight Series features individuals who inspire and bring hope to their local CF community and raise funds and awareness for cystic fibrosis – all while climbing to the tops of stadiums and buildings around the nation. We hope these stories give you insight into the determination and passion of these climbers, and that you consider participating in a climb. Together, we can reach new heights in the quest for a cure for cystic fibrosis. “Two years ago, for our 10th wedding anniversary, Mary and I went on a vacation to Hawaii,” said Erik Hudzik. Mary, diagnosed with cystic fibrosis at birth, was used to having to reschedule vacations based on her everchanging health, so she was excited to be able to take a trip with her husband. For months, they had looked forward to a volcano summit hike, which promised a beautiful overlook view at the top. “It didn’t take long before Mary told me that she couldn’t go any further,” Erik said. This moment still stays with Erik when he trains for CF Climb event each year. 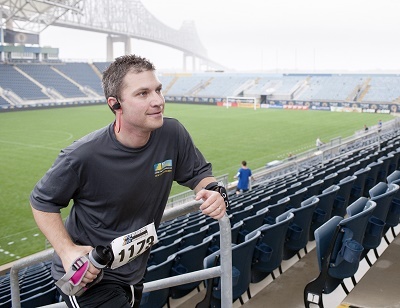 CF Climb, the Cystic Fibrosis Foundation's annual event, gathers together thousands of participants across the country to race the stairs of a tall building or stadium in a challenge of will and endurance to raise funds to find a cure for cystic fibrosis. Erik became involved with CF Climb in 2010 and hasn’t looked back since. “I liked the fact that CF Climb was unique and something a little different than your average fundraising 5k race. The event is short, but it’s a big physical challenge. You’d be really surprised by what you can say you accomplished from both a physical and fundraising standpoint at the end of the climb,” he said. “Training for this event is also a great opportunity to post on social media to help with fundraising,” explains Erik. He regularly posts videos and photos of his training routine – running up and down his basement stairs – on social media to give people an insight into the event and remind them to support his fundraising goals. CF Climb allowed Erik to overcome his hesitations about asking for donations and realize the importance of reaching out to his entire network. “This is our story. I’ve learned to share and be real with people when asking for their support.” He makes sure to reach out to every connection – whether that’s friends, family, co-workers, or past recreational league teammates. 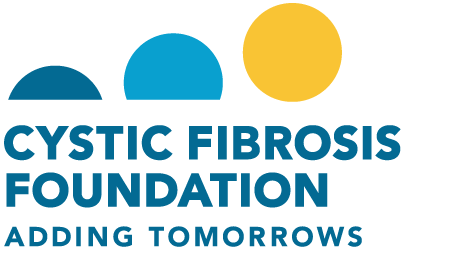 Find a CF Climb event that interests you and sign up today to get us one step closer to cure cystic fibrosis. Erik Hudzik returns to CF Climb each year to tackle hundreds of flights of stairs and raise awareness about CF to support his wife, Mary. Search for a Climber or team to make a donation, or make a general donation.